Carrots, beets, radishes, and parsnips can all be successfully grown throughout South Carolina, and these can all be planted for both spring and fall crops. Root crops all need a loose, friable soil, and compost, manure or other soil conditioners can be incorporated into the garden before planting to improve the quality of both the soil and the roots to be harvested. Due to the short time from seeding to harvest, radishes can be a fun crop to plant with young children. Fertilizing: It is best to base fertilizer and lime applications on the results of a soil test. The garden should be limed to a soil pH of 6.0 to 6.5 for the best growth of these root crops. If a soil test has not been taken, apply 5-10-10 fertilizer at 30 pounds per 1,000 square feet of garden before planting. For more information, see HGIC 1652, Soil Testing. Sidedress fertilize these root crops when plants are 4 inches tall. Sidedress with either calcium nitrate at 2 pounds per 100 feet or 34-0-0 at 1 pound per 100 feet of row. More frequent sidedressing may be required if the garden is sandy or if leaching rains occur. For more information, please see HGIC 1254, Fertilizing Vegetables. Watering: Water the garden to provide a uniform moisture supply to the crop. The garden should be watered in the morning so that the foliage is dry before dark. Water the garden sufficiently to moisten the soil to a depth of 6 inches. The critical periods for water are during stand establishment and root development. If a uniform supply is not provided for carrot growth, then cracks, strong flavor, and coarseness in the roots may develop. For more information, please see HGIC 1260, Watering the Vegetable Garden. Weed Prevention: Weed control is important, especially during the early stages of development, because these crops are poor competitors with weeds. Shallow cultivation and organic mulches are the best methods for weed control in the home garden. Keep the cultivation shallow to avoid root injury. For more information, please see HGIC 1253, Controlling Weeds in the Vegetable Garden. Carrots (Daucus carota) are cool-season plants that grow best at average temperatures between 60 and 65 °F. Planting: Carrots (Daucus carota) are cool-season plants that grow best at average temperatures between 60 and 65 °F. The optimum soil temperature for seed germination is 55 to 75 °F. Seeds will not germinate above 95 °F. It is important to plant carrots early enough in the spring to ensure that the crop is harvested before early summer. Carrots near maturity that are allowed to remain in the garden under high temperature conditions tend to develop a strong flavor and roots that are coarse and fibrous. Cultural Practices: Carrots prefer a good-textured, loamy or sandy soil that is free of stones and clods. When grown in heavy clay soils, the carrot roots will grow poorly, and they may be forked or misshaped. Plant carrots in rows 12 to 18 inches apart with a quarter-inch between the seeds. Carrot seeds are very small, and it is difficult to obtain a stand if the soil is crusty. Try mixing carrot seed with dry sand to get even distribution. Then, instead of covering with soil, cover the seed 1/8-inch deep with sawdust, vermiculite or manufactured potting soil. Water the row soon after planting is complete. This method will allow the seeds to stay wet and prevent crusting. Thin the carrots to 2 to 3 inches between plants when they are 1 to 2 inches tall. Harvest & Storage: Harvest carrots about 65 to 75 days after planting. Carrots should be harvested when they reach the desired size. Store them at 33 °F and high humidity to prevent wilting. Bunched carrots (plants with tops on) can be stored for about 10 to 14 days. Carrots with tops removed can be stored for four to six months under optimum conditions. Problems: Insect and disease problems are usually minor for carrots when grown in the home garden. However, seed should be obtained from a reputable source to minimize the chance of any seed-transmitted diseases. Six-spotted leafhoppers can be a problem on carrots, partly because they transmit a disease known as carrot yellows. The parsley worm, which is the larval stage of an attractive swallowtail butterfly, will feed on carrot leaves but the damage is seldom severe. A fungal disease, called Alternaria blight, causes spots on the leaves. Root-knot nematodes can also be a problem with the roots of most vegetables. Planting: Beets (Beta vulgaris) are cool-season plants that grow best at temperatures between 60 and 65 °F. The optimum soil temperature for seed germination is 55 to 75 °F. Beets prefer soil that is loamy or sandy. Hard clay soils prevent root enlargement. Beets require full sun and will not make good roots in partial shade. Protect beet seedlings from the wind because the young plants can rapidly dry out. Plant beets in rows 10 to 30 inches apart and place the seed ½ inch deep with about 2 inches between the seeds. When the seedlings are 3 to 4 inches tall, thin them to 2 to 3 inches between plants. Red Ace Beets growing in the garden. Cultural Practices: Beets require full sun for optimal growth and yield, and cool temperatures will result in the best red color in beets. Weed control is important, especially during the early stages of development, because beets are poor competitors with weeds. Shallow cultivation and organic mulches are the best methods for weed control in the home garden. Keep the cultivation shallow to avoid root injury. Harvest & Storage: Harvest beets about 50 to 70 days after planting. Beets should be harvested at 1½ to 2 inches in diameter. Beets allowed to get larger than 2 inches in diameter may be woody. Store them at 40 F and high humidity to prevent wilting. Problems: Late planting causes the most frequent problems in beets. Fewer disease or insect problems occur when they are planted at the proper time. The most common insect pests of beets are aphids, leafminers, flea beetles, and webworms. Sanitation and crop rotation should be practiced to avoid pest build-ups. Beets should be harvested at 1½ to 2 inches in diameter. Barbara H. Smith, ©2016 HGIC, Clemson Extension. Cercospora leaf spot is the most common disease that occurs on beets. Circular spots with reddish brown or purplish margins are the first signs. Beets are also very susceptible to damping-off and root-knot nematodes. Beets will develop internal black spot if soil boron is not adequate. Planting: Radishes (Raphanus sativus) are fairly easy to grow. They mature anywhere from 21 to 30 days from seeding, depending on soil and air temperatures during their growing time. For radishes, the warmer it is, the faster they mature. Radishes prefer cool and moist conditions for best growth. The optimum temperature is 50 to 65 °F. Optimum soil temperature for seed germination is 45 to 85 °F. Radish seed will not germinate when the soil temperature is above 95 °F. Spring-planted radishes should be harvested early. The flavor of the radish bulb is also dependent on temperature. As a general rule, the cooler the temperature, the milder the radish. High summer temperatures cause radishes to crack, become pithy, and develop a strong flavor. Sandy to sandy loam soils are best for radishes. Plant radish seed in rows 12 to 24 inches apart and place the seed ½-inch deep with about 1 inch between seeds. Radish can be broadcast-seeded in a 12-inch bed and then thinned to 2 to 3 inches apart when plants are in the one to two “true leaf” stage, about 2 inches tall. Radishes are some of the fastest germinating seeds and should emerge in just a few days. Plant every seven to 10 days during the recommended planting periods for a continuous supply of radishes. Fresh dug radishes straight from the garden. Red: Scarlet Globe, Cherry Belle, and Cherriette. Cultural Practices: Cultural practices for growing radish are the same as for growing beets and carrots. Moisture stress during development of the radish will cause it to have a strong flavor and be woody or pithy. Radishes planted in late spring will bolt (form a flower stalk) as the temperatures get warm in late spring and early summer. Radishes that have bolted have a strong flavor and are pithy. Harvest & Storage: Radishes will be ready to harvest in about 3 to 4 weeks after planting. These plants develop very rapidly; therefore, check the plantings frequently to prevent them from becoming too large to use. The round red radish should be harvested before it is an inch in diameter. Larger radishes will usually have a strong flavor and will be pithy. White radishes should be harvested before they are about ¾ inch in diameter. Radishes can be stored in the refrigerator for about two weeks. Problems: Insect problems that may be encountered are flea beetles, aphids and various caterpillars, such as cabbage loopers, and diamondback moths. These will feed on the radish leaves. Cutworms can be a problem for seedlings. They will feed on the surface of the bulb. In small gardens, barriers around plants can prevent serious cutworm damage. By encircling individual plants with cardboard or metal “collars” pressed one inch into the soil, gardeners put up “fences” the cutworms cannot cross. Diseases are usually not a problem when radishes are grown in the home garden. Seed should be obtained from a reputable source. Planting: Parsnips are seeded into the garden at 2 to 3 seeds per inch of row and covered to ½ inch deep. Rows are spaced 18 to 24 inches apart. When the parsnip plants are 1 to 2 inches tall, thin them to 3 inches apart for good root development. Seeds are slow to germinate and may take 18 to as much as 60 days. Keep soil moist during germination period. Cultural Practices: Parsnips are related to carrots and are grown for their long carrot-like, white roots. Similar to carrots, they need a loose, well-drained soil, and weeds should be controlled. Parsnips do not tolerate dry soils, so weekly irrigation may be necessary. Plants should be lightly mulched. 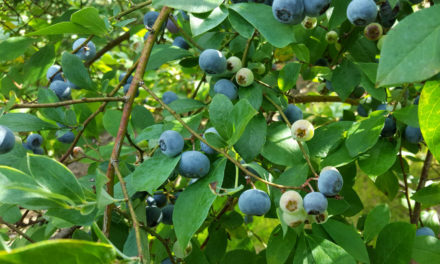 With a fall planting, plants exposed to near freezing temperatures for 2 to 4 weeks at the end of the season may better develop the unique sweet flavor for which they are known. Harvest & Storage: The time from seeding to harvest may take from 120 to 180 days. Roots are harvested when the tops of the plants freeze, and the roots are 1½ to 2 inches in diameter and 7 to 8 inches long. The roots may be harvested and stored, or left in the soil and pulled as needed. Problems: Seed does not keep well, and fresh seed should be planted each year. Roots will crack if soil is allowed to become too dry. 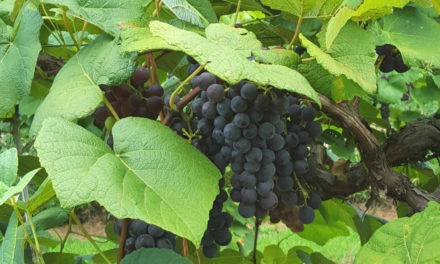 Some people may develop a rash from contact with juice from the foliage when working with the plants in direct sunlight, so wear gloves to prevent contact during harvest. Parsnips are relatively pest free.